When I first started participating in the closed beta, I thought cruisers symbolized my playstyle. Fast, maneuverable, powerful yet also tanky enough to survive hits. Especially IJN Cruisers were my favorites with their firepower. However, as patches followed each other, the hunter suddenly became the hunted. Cruisers became the juicy glass cannons that BBs snacked on or the DDs preyed on at later tiers. The whole game got a bit boring and I took a break. 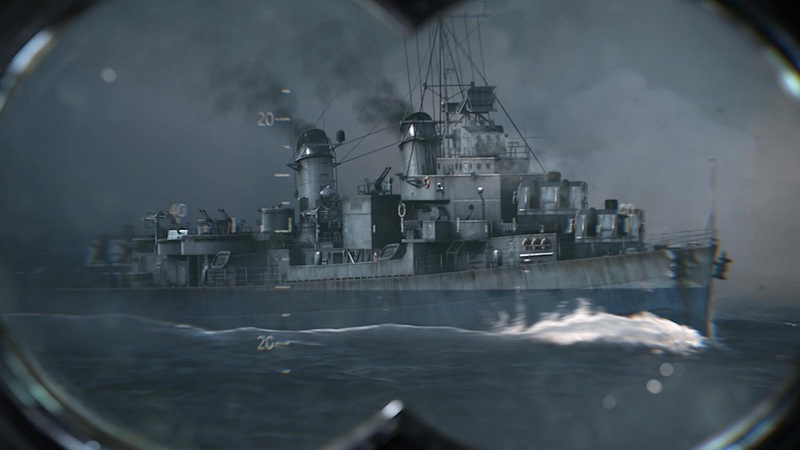 Then, came the Russian destroyers and after watching some gameplay, I thought this might be it. They seemed to have everything cruisers promised: speed, guns, torpedoes and durability. Indeed, I loved them so much that after a month of seal clubbing I was looking at my first Tier 10 ship in my port; the Khabarovsk. However after the great Russian HE nerf and the cutthroat environment at later tiers that punish being perma-spotted, I started looking for an alternative. Something perhaps sneakier, but with comparable firepower and aggressive gameplay. We all know which line I'm talking about. I despised USN DDs for a long while. I thought they were great up until Nicholas with 5"/50's guns, but I just couldn't stand the 5"/38s. That floaty arc made it really hard to hit anything maneuvering above 7-8 kms. The gunplay seemed boring. Their short-legged torps also looked pretty useless. It was obvious that they were meant to be brawlers, but with no stealth torping option they were too "all-in"ish for me. This was later confirmed as I clubbed every single USN DD all the way up to the Gearing as I was leveling my RU DDs. Heck, my Kiev could handle a Gearing no problem before the nerfs. What was the point in USN DDs again? However, the nerf hammer came for the RU DDs and at the same time USN DDs were buffed. I kept hearing good things about them (especially the Benson and the Fletcher). When they finally gave the Farragut a 5-gun hull upgrade I finally caved in. A week later, I have a fully upgraded Fletcher in my port . . . and oh boy was I wrong about USN DDs. These things play even more aggressive than the RU DDs and I love it. But, let's talk about Russian DD gameplay first. Udaloi is where the RU DD tree gets some serious firepower. Rapid firing guns with flat arcs and good velocity. AP shells that penetrate at wide angles. Weak HE shells (weakest HE at later tiers). Mediocre torpedoes with no practically stealth torping application. Only brawl use. A bigger HP pool than their tier counterparts. Fastest, but wide turning radiuses and a mediocre rudder shift time. Worst concealment among DDs. Huge concealment penalty to firing. Horrible smoke duration. Mostly defensive use. There's nothing stealth about these things. It's all about being out there, deterring other DDs and harassing bigger ships. These things are the king of the mid-long range of the DD realm and can really hurt CAs that don't take you seriously. BBs are mostly helpless since their guns are too inaccurate to land proper hits above 10kms. These thing are the bane of the enemy team if left unchecked. However, aggro management and positioning is an art that every competent Russian DD captain must master. Especially at later tiers, it's so easy to get overwhelmed by the enemy focus fire when you reveal yourself at unfortunate moments. These often result in you popping a gun or two and your game being completely ruined from that point, since your torps are only situationally effective. You must also take care not to get ambushed by USN and multiple IJN DDs, since you're more likely to get crippled by their better HE shells. When it comes to DD vs DD, you will win pretty much every engagement bar some very close knife fights where USN DDs start out DPS'ing you. IJN DDs will also lay fast torp walls if you get too close, they can be avoided but sometimes RNG says no. Therefore you should always seek to put at least 5-6 kms between you and your enemy, less if they're running away. So if you meet an USN DD wait for him to fire so you can keep spotting him and then immediately turn away, pulling to range while landing 1-2k salvos. As you open the distance, the USN DD will be forced to disengage as he'll struggle to land hits. Then you can either let him go if you're being shot at by enemy cruisers or chase and kill the crippled DD. Since you're so dominant in 1v1s, most of the times your presence will be enough to keep stealth torpers away from your big guys. Cruisers will be your worst enemies, since you'll be spotted most of the time. At later tiers competent IJN and KM CA's will have no trouble hitting you above 10kms so you'll have to be really careful about how to handle them. My approach is to wait for them to be distracted, get a good angle on their sides and then just axe their HP with the AP shells. Then, either disengage before the rain arrives or turn away and pepper them with HE, hoping for fires. Spam torps whenever possible, you never know who's lurking on you. Sometimes the shell spam from the RU DDs can get to a point where they can turn a whole enemy flank busy, perhaps you can even send them turning back. BBs are your main form of damage (as is true for other classes) and they can do little to prevent it themselves. There are two options for engaging them, you either keep them lit at medium to long ranges HE when angled and AP when you see a broadside (3-8k salvos are possible). Or you can choose to ambush, use your speed and rapidly close the range for a fast torpedo run. Especially the Kiev is great at this because of its speed and insanely fast 10x70kt torps. The latter usually results in massive damage to your ship, if not outright death because BBs do can hurt you at close ranges. CVs depend on their loadout. Since you'll be spotted most of the time, them having fighters above you isn't that important. You can also evade most torpedo runs due to your insane speed (you can push through torps before they arm, or you can simply outrun them). What hurts you the most are the dive bombers and there's little you can do against them. Your AA is decent, but you're lucky to shoot down 1-2 aircraft on your own. Before we finish, I want to talk about the "perma-spotted" aspect of these ships. Yes, you'll get shot at while you shoot yourself. However, with your speed and decent turning you can actually dodge most of the shots. Therefore, the Russian DDs are kind of "speed tankers" for your team. If you have one BB and two cruisers raining shells on you instead of your team, then you're doing a great service to your team already. The best matches happen when the enemy lets you shoot non-stop, so I found out you do the best when you put yourself in spots to be able to do so. Offensive smokes help, but since their duration is very short, don't count on them. Overall, let the other DDs run in front of you and then do your thing. Try to put some friendlies between you and the enemy. Pushing alone usually results in either being ambushed/spotted by other DDs and being peppered by cruiser fire. 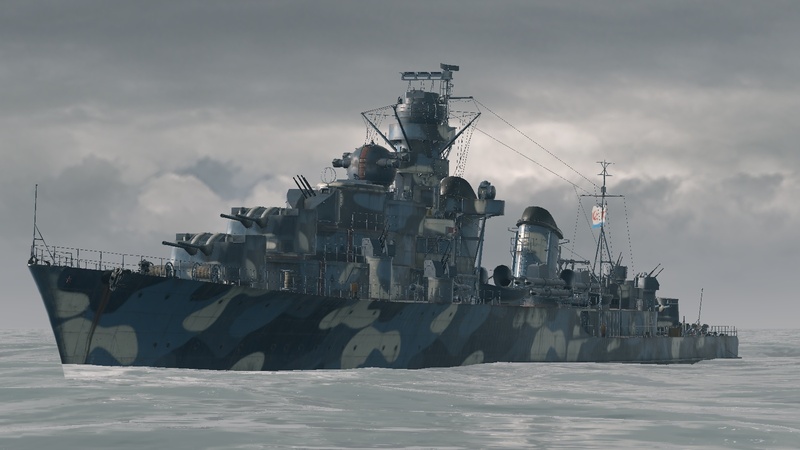 Many consider the Fletcher to be the pinnacle of the USN DD tree. Rapid firing guns but horrendous shell flight times and trajectories. Decent HE shells, AP only gets good penetration at close range. Mediocre to awesome torps, depending on the tier. Usually slower than RU and IJN DDs. Excellent turning radius and rudder shift time. Better concealment than RU DDs, but worse than RU. Stealth torping possible after Tier 6. Good AA and Defensive AA with the hull upgrade. Best smoke duration and the number of puffs. Initially it looks like a mess. However as you go up the tiers, the USN DD line slowly eases you into a very different playstyle. A very exciting but dangerous playstyle, that you'll slowly get the hang of it. The good news is you're both a good gun boat and a torpedo boat and the bad news is you need to get close to utilize both properly. So you get close, make a mistake and die. Eventually, you start making less mistakes and then you see how effective they can be. USN DDs are best described as ambushers. They're the strongest at close ranges. You use your excellent concealment to roam near the enemy ranks, torp and scatter their ranks, lay offensive smokes and set them on fire. Do area denial. If you stumble into another DD at detection range, you use your insane gun DPS to take care of them. Using smoke properly is crucial for the USN destroyers, not only they always get +30 seconds of duration over the IJN and RU DDs (they use the same smoke), but they generate more smoke (more duration and smoke puffs). You can essentially smoke kilometers in length and just move up down in it lashing out flames and torps. Your guns won't do much damage to armored targets, but you'll set a lot of fires and it's extremely irritating to be caught under that 21RPM HE rain. It's essentially an area denial weapon. The enemies caught in your gun range won't have any chance to either flee or directly rush you, both of which works in your favor. USN torpedoes are also unique in the sense that they're all 533mm launchers at later tiers. This means they get detected very late by the enemies, giving them almost no time to take evasive action. This is especially useful for torping BBs but even CAs and DDs sometimes fail to turn in time. You won't be able to leverage this until you can stealth torp starting with the Mahan (even then, your torps will be too slow) but starting with the Fletcher which gets 66kt torps, you start doing a lot of torpedo damage. The USN Destroyers are also the only DD line with access to Defensive AA ability. However up until the Fletcher you'll rarely use it since you need to sacrifice a gun (get the C hull) to be able to do so. Admittedly the CVs won't be much of a huge threat to you until later tiers as well. However starting with tier 7-8, carriers start getting competent and they try to delete DDs at every chance. This is where the Defensive AA comes in, because it saves you from certain death when you see murderous Lexington DBs or a Taiho plane blob converging on you. Their AA is also very decent, I've had plenty of matches where I shot down more than 20 planes in my Fletcher for example. Lastly, the USN DDs deal with punishment better than other DDs, mostly due to their single-turret layout. The Russian DDs lose a lot of DPS when they get turret incapacitations but USN DDs just keep trucking with their remaining 4 turrets. Losing turrets also don't mater much when the rest are working and even if you lose many, you still have great concealment and very workable torpedoes whereas Russian DDs just become sad pandas. Survivability expert makes a lot of sense on them for this reason. Your main prey are obviously other DDs. With your concealment you get into your effective gun range before you're detected and start dismantling them with your high ROF guns. You need to learn a lot about juking their torps, but it's not hard to avoid most panic torps. Cruisers are best avoided and torped in USN DDs. At later tiers your HE doesn't do much to them and you can't hope to punish them with citadels like Russian DDs. AP shells do pitiful damage unless point blank. I suggest you to keep at least one torp volley when you see a cruiser pushing towards your smoke. Resist the temptation to fire them all quickly. You'll regret when they spot you in smoke and you'll have only torpedoes to save you. BBs are there to be set on fire, stealth torped and generally milked of HP. They're the least of your concern as a threat unless they decide to load HE or you come across a secondary spec BB. 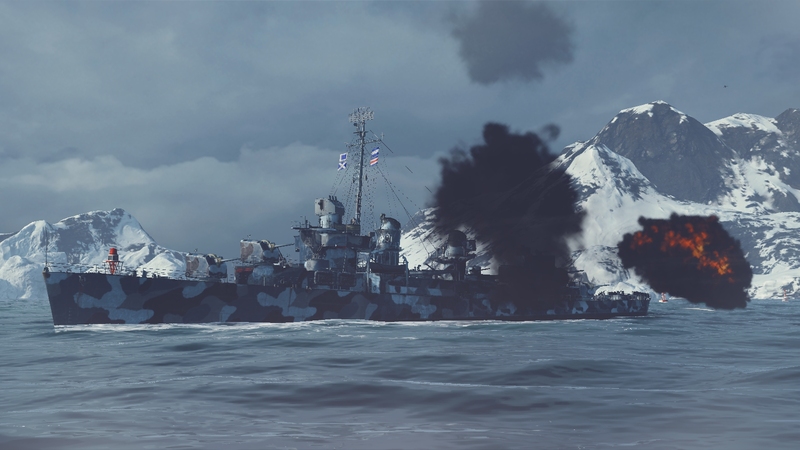 Overall, the USN DDs are jack of all trades but it doesn't make them mediocre. On the contrary, it makes them really good since you have an answer for everything and every situation. Does your team need caps? You're the best candidate to do it. Do enemies need to be held off the cap? Drop smoke and rain fire. DD problem? Rush them and out DPS them. Plane blob incoming? Pop defensive fire, CVs never expect it from a DD. Time to deal with the big guys? Stealth torp your heart away. Currently, I believe if you're an aggressive type, these are two of the most enjoyable lines in the game. They start off a bit shaky in the beginning, but they get considerably better as you climb the tier ladder.